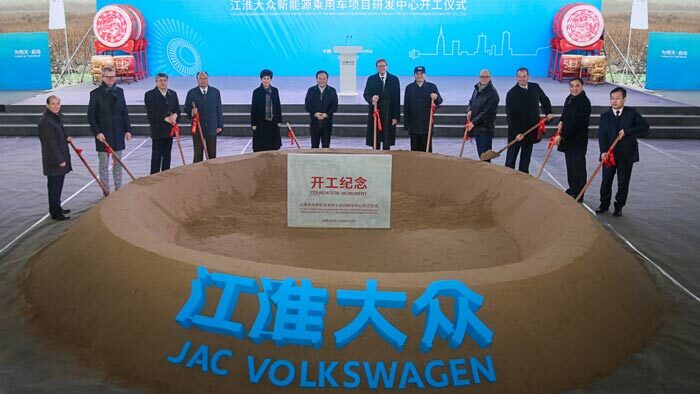 JAC Volkswagen Automotive Co., Ltd. held a groundbreaking ceremony for the New Energy Passenger Vehicle Project R&D Centre located in Hefei, Anhui Province, China, on 11 December 2018. The ceremony came two weeks after a strategic agreement was signed by Volkswagen Group China, JAC and SEAT in the presence of Chinese President Xi Jinping and Spanish Prime Minister Pedro Sánchez. The R&D centre, located in the Hefei Economic and Technology Development Zone, will focus on key areas such as electrification, connectivity and autonomous driving. All parties will leverage their investment, knowledge and technology strengths to ensure the R&D centre fulfills its goals. This project is an indicator of the progress that JAC Volkswagen is making in its battery electric vehicle offensive, and signals a firm step towards the next stage of development. “At SEAT, we are very proud to be the lead brand within the Volkswagen Group in the JAC Volkswagen joint venture. China is the world’s leading market for the electric vehicle and SEAT’s will is to contribute, together with our partners, to make mobility increasingly more sustainable,” said SEAT Vice-President for Production and Logistics and Member of the Supervisory Board of JAC Volkswagen, Christian Vollmer. E-mobility, along with digitalisation, connectivity and autonomous driving, are the future of the mobility industry, and China has established itself as a major driver of this transformation. The construction of the R&D centre not only fulfills the agreements signed on 9 July 2018 and 28 November 2018, but it is also an important cornerstone for the development of JAC Volkswagen in China’s new energy vehicle industry. “I feel very proud and excited to witness this historic moment. With the rapid development of the electric vehicle industry, JAC Volkswagen, as the first joint venture dedicated to these vehicles in China, is taking full advantage of its shareholders’ resources to meet the needs of Chinese customers and build a sustainable mobility future with new technology,” said First Vice-President of JAC Volkswagen, Peter Wyhinny. This is part of the effort made by Volkswagen Group China and its joint ventures in the e-mobility field, which will see the launch of 30 new energy vehicle models in the next two years, half of which will be produced in China. The Group aims to deliver around 400,000 new energy vehicles in China in 2020 and is preparing to deliver around 1.5 million in 2025.